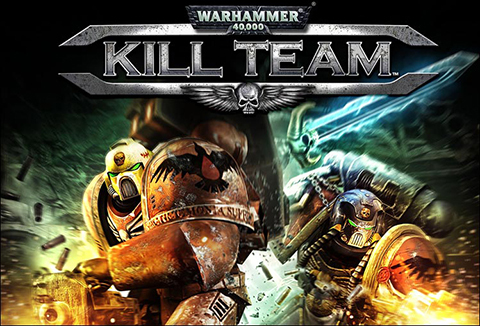 Warhammer 40,000: Kill Team is a twin stick shooter and is the latest offering from THQ Digital Studios UK with the full cooperation from Games Workshop that’s out now on Xbox Live Arcade and Playstation Network. From the opening cinematic, it’s obvious that this game is going to be true to the 40K cannon and a treat for fans of the series. The basic premise of the Kill Team story is that you play as one of the super human Space Marines from your choice of one of six chapters that is sent to board an Ork Kroozer that is en route to an Imperial Forge world, and yes it’s a perfect lead up to THQ’s other offering later this summer, Warhammer 40,000: Space Marine. It’s also worth noting that completing a mission in Kill Team unlocks the Power Sword in Space Marine, a nice crossover bonus. In Kill Team, you start out with the option of picking from one of 4 character classes, all of which come straight out of the 40K universe, although to be honest, 2 of those classes probably should have been given their more generic type instead of the more flashy names. I’m talking about the Sternguard Veteran which would have been more appropriately labeled as a Devastator Marine since he runs around with only heavy weapons, and the Vanguard Veteran who is equipped with a jump pack and close combat only weapons and could have just been called an Assault Marine. I can understand why they used the names they did, and the descriptions for each are spot on, but longtime fans for a moment might question the choice. The other 2 classes are the psychic power enabled Librarian and the Techmarine, which are both right on when it comes to descriptions. I’ll mention this while I’m at it that all 4 character models look perfect, weapons, armor, and chapter coloring and insignia are all just as they should be. All characters have a specific weapon setup with an upgradeable primary weapon and a secondary weapon that gets charged up for use in combat. The Sternguard Vet starts with a Heavy Bolter that upgrades to a Plasma Cannon and then to a Rocket Launcher. The Vanguard starts off with a Chainsword and Bolt Pistol, the Chainsword upgrading to a Power Axe then to a single Lightning Claw, which along with his Jump Pack makes for a cool secondary attack. The Librarian gets a Bolt Pistol and Power Sword, which upgrades to a Force Sword then a Force Sword Epic. The Techmarine seems almost basic compared to the others with his Bolter starting weapon and Servo Arm for close combat, the Bolter upgrading to a Plasma Gun and Melta Gun. For the Sternguard and the Techmarine, I think they should have made the Plasma weapons the final upgrade, even though the Rocket Launcher does heaps of explosive damage, the Plasma weapons are just plain cooler to shoot. The characters also have 2 Perk slots that can be filled with an assortment of items that range from health and combat bonuses, to power-up recharge increases. When it came to game play, I found myself using the Sternguard Veteran as my default character, with the Vanguard a close second. The Techmarine felt underpowered even though his secondary weapon, the Tarantula Turret, which would have been better if it was movable, was still really cool. The Librarian was a bit the same way, his close combat sword was great close up, but he lacked in fire power with just a Bolt Pistol and his secondary power just seemed weak compared to the 2 Veteran classes. So much that I struggled in the second mission where it required me to shoot an engine and wouldn’t let me use my Force Sword which was way more powerful than the weaker Bolt Pistol I carried. Other than that, game play mechanics were great. Use the left stick to move and the right stick to shoot in the direction you point it in. The camera is never really in a bad spot which is good considering it moves on its own and has that classic arcade style of moving around to kind of make the most theatrics of what is going on around you. About the only time the camera was a little off was on the third mission when traveling on a platform I couldn’t really see the Spore mines that I had to shoot, but really it was just a slight hindrance and watching the on screen radar let you kind of figure out where they were anyways. I was a little miffed that grenades had to be found and then were only limited to 3 at a time, but I can understand it for gameplay balancing. The only time they became a factor for me was when facing a horde and my health was low, it was easy to just toss a grenade into the mess and kill off some Ork baddies. Kill Team’s campaign is 5 levels long, and while that may sound short, each level will take roughly 30 to 45 minutes to complete with each character class, assuming you don’t die that is, which works out to a nice amount of 40K for an arcade game. The level pacing is great and although you face massive amounts of enemies, it’s never anything you can’t handle. There are checkpoints placed at appropriate locations and plenty to move through and fight in each level. I don’t want to give too much away but there is more to this Ork Kroozer than just a bunch of Greenskins, and when that more appears it’s appropriately terrifying. The campaign also has a cool scoring system that rewards you for kill streaks with streak names like Devastator, Angel of Death, and Bloodbath. Series fans should thoroughly enjoy all the subtle names and comments that are spread throughout the campaign. Kill Team is designed to be played as a co-op or single player game, unfortunately no online co-op or online play really limits this game. Considering the majority of players on XBL or PSN are probably playing games with their friends online, and not sitting next to each other on the couch, I think that THQ missed a huge selling point by not including online co-op. I know I have a number of friends who would have loved to play this game with me but because we don’t live nearby each other, we can’t. The other option in Kill Team is to play Survival mode, which is basically a Firefight or Horde mode. You can play solo or co-op (not online obviously) and you don’t get to choose your class, but you do get to play on 1 of the 5 different levels from the campaign. You’re basically tossed into an arena from that level and fight through wave after wave of enemies to see how long you can survive. Survive long enough, and you’ll earn a gold Aquila. It’s a nice addition to keep players coming back to see how long they can hold out and try and climb the leaderboards. But what it really does is keep your appetite wet for that other 40K release coming in August. A nice touch that Kill Team features is Codex entries for the 4 Marine classes as well as all the baddies you face. Anyone new to the 40K universe that doesn’t know the difference between a Gretchin and a Stormboy can go in here and not only read a brief description of each, but get a short narration as well, along with some concept art to boot. All in all Warhammer 40,000: Kill Team is a great arcade shooter that’s worth its asking price, if you like twin stick shooters. If you’re a 40K series fan this one is a no brainer, pick it up just because you should and it’s fun. If you’re more of the casual type and don’t mind playing alone or with a friend on the couch next to you, also then a great find of a game, although you may find it a bit short to play through. If you’re looking to play online with your friends, then this is not the game for you as there is no online co-op or versus mode. It’s still a good game, just keep in mind, it’s local co-op only. As an arcade game, I recommend this to everyone who likes shooting things and especially to 40K fans. Brothers, prepare to drop, and may the Emperor be with you.